The facts of the investigation into the deaths of older patients at Gosport War Memorial Hospital in the 1980s and 1990s make horrific reading: 456 people whose lives were ‘shortened’ as a result of the inappropriate prescribing of opioid painkillers, a possible 200 more who may have suffered a similar fate, but whose records have gone missing – and a question mark over why potentially faulty syringe drivers were not included in the inquiry. When I first saw these figures, I was transported back to visiting my dad, around 2009, during an inpatient stay at his local hospital to have an infection treated. He was living with advanced vascular dementia, which meant that he could not communicate clearly with words, was immobile, doubly incontinent and had been living with dysphagia for around a year. I am, by my own admission, nosy when it comes to the healthcare of my loved ones. Each day I would check the notes at the end of Dad’s bed that detailed his observations and medication chart. On that one visit, I saw morphine on the medication chart. It had never been there before and Mum and I were confused as to why Dad would be given morphine. When I asked a nurse, she said the doctor had prescribed it because he was in pain. Granted, Dad was distressed. He was not relaxed in bed and he was vocal, but he was not in pain. His cries were those of hunger. When Dad had been admitted, he had been quiet as he was so poorly, but as the antibiotics and fluids had done their work he’d found his voice. 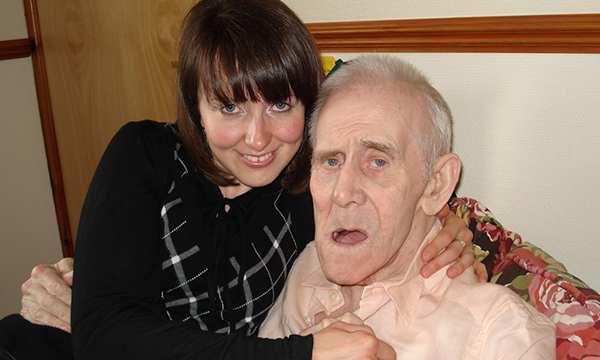 We knew what Dad needed because we knew him, and although professionals were reluctant to offer him food because of his dysphagia, we took responsibility, fed him and watched him return to a contented 82-year-old. The doctors and nurses saw the difference and the next day the morphine was removed from Dad’s drugs chart. To this day I have wondered without a family who visited daily and were nosy, would Dad have been given that morphine? And if the initial dose didn’t quieten him, would he be given a little more… and a little more? A defining factor in the Gosport inquiry was how families’ concerns were ignored – as were nurses who tried to blow the whistle on what was happening and were ‘silenced’ by management. While the lessons from Gosport will be extensive and are yet to be fully understood, those from our experiences as a family are there for all to see. With an estimated 25% of hospital beds occupied by a person living with dementia, many of whom may be unable to communicate clearly, enhancing healthcare professionals’ understanding of each person is vital. Intuitive and effective training that helps professionals to work with patients is part of that, but so are simple initiatives, such as every patient having the Alzheimer’s Society’s ‘This is me’ document and every professional involved in their care reading and using it. To end toxic cultures such as Gosport we need teamwork between patients, professionals and families so that the needs of all patients are known and met, not guessed or presumed. A simple initiative such as John’s Campaign for the right of people with dementia to be supported by their family carers can help to foster those relationships. Where any of us are privy to a decision that we believe isn’t in the patient’s best interests, we need to find the courage to challenge and to keep challenging those decisions until change happens. As a person who challenged numerous decisions about Dad’s care, I know sometimes it’s the hardest thing to do, but it can be the difference between life and death.